Toronto Maple Leaf fans likely won’t agree, but Jake Gardiner is a really good hockey player. If you don’t think so, watch what happens when he becomes an unrestricted free agent after his contract ends this summer. Teams will line up to sign him, and he will accept one of those offers, for good money. There is no question Gardiner will leave the Maple Leafs, but it won’t be because the team doesn’t want him. They simply won’t be able to afford him, nor will he be inclined to stay. The team that happily signs him will be one with the salary cap space to make that signing possible. It will be a happy day all around, and the only one not invited to the party will be the Maple Leafs. If I were Gardiner, I’d be happy to go. First, unlike other Maple Leaf stars like Mitch Marner and John Tavares, he has no ties to the Toronto area. He grew up in Minnesota about 30 minutes away from the Minnesota Wild’s Xcel Energy Center. Hmm. Second, the Maple Leaf fans have been unrelenting and unforgiving in their booing. Good hockey players – stars even – make mistakes. In Monday’s 6-3 loss to the Colorado Avalanche, Gardner made a huge mistake and heard the boos of hometown fans. I’m thinking these fans recall vividly his poor Game 7 against the Boston Bruins in the playoffs last season, and he has become a focus of the fans’ ire since. On Jan. 17, The Hockey Writers’ Will Billinghurst wrote a post about this booing, and rightly suggested that fans have a right to boo. Hockey is, after all, a professional sport. That said, because it is a professional sport, there is no compunction on Gardiner to stay and endure such wrath. Although he wisely didn’t show his pain in public, he would have to be almost uncaring to not be hurt. Sure his teammates stuck up for him, but I know myself how criticism impacts one’s work and self-feelings. We probably all do. Gardiner erred. He was out-muscled by the Avalanche’s Carl Soderberg, who stripped him of the puck and scored shorthanded. Gardiner didn’t deserve being booed: it was just a mistake that, as teammate Rielly noted, is the nature of hockey. Because hockey is a game where scoring is relatively low, most mistakes mean little. The other team’s players soon make a mistake themselves, and the game turns and goes the other way. That is until that team makes a mistake, gives up the puck and the play turns and goes the other way, until….you get the point. Hockey is a game of mistakes, and these mistakes create the action on the ice. No mistakes means a dull game: that’s not the game we love. Related: Should Maple Leafs’ Fans Be Booing Gardiner? Gardiner faces tons of criticism in the Toronto marketplace, but he clearly is, and would be, a top-four defenseman on any other NHL team. That will happen next season. He’s on-pace and should approach, if not pass, 50 points this season. Furthermore, if he is so awful, why does he have the team’s third-highest plus/minus at plus-18? As I say, another team will be happy to have him next season. Gardiner is a very good hockey player who has a bad game now and then, and he makes mistakes. To his credit, as he’s matured as an NHL player, he has been very good more often than he’s been horrid. Like all NHL players, Gardiner has shortcomings. But his faults are not the result of a lack of caring or not working to improve. They’re more a product of how he’s used on a weak Toronto rear guard. Furthermore, the Maple Leafs’ poor defense forces Babcock to use Gardiner mostly in five-on-five situations. Imagine how good he would be if he were used more exclusively to run the power play. His best season was two years ago when Babcock avoided playing him against the other team’s top line and used him in situations in which he could flourish. Certainly, other NHL teams desire offensive-minded defensemen like this 28-year-old. General manager Kyle Dubas passed up a chance to trade Gardiner with a year left on his contract. Unfortunately, the way things turned out, that means he will either be traded this season, when the team needs him as it moves into the postseason, or he will stick with the team and the Maple Leafs will lose him for nothing when he signs a new contract with a team looking for a puck-rushing, power-play quarterback in free agency this summer. Likely, Dubas is stuck. 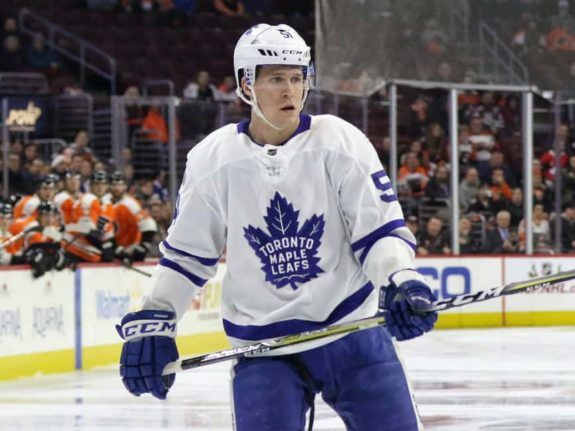 The team became vulnerable because it played Gardiner in a role that didn’t fit him well, which also caused the ire of the fans in ways that will undoubtedly impact his thoughts about where to sign. As I agreed, Maple Leaf fans can boo if they choose. That’s their privilege as fans. But, surely Gardiner will remember those boos when he considers his next contract. In my experience, no one is, nor should they be “professional” enough to not care about treatment from fans. I’m believing those memories will be painful in ways that hurt the Maple Leafs at a most inopportune time. In fact, my call is that Gardiner will leave the Maple Leafs and will be criticized by some fans for being disloyal. Those fans will forget they were part of the reason he left. He will graciously and professionally thank the fans, but part of him will be relieved to be gone. Perhaps Gardiner’s treatment by fans will galvanize the team against something. It would be good if the Maple Leafs grew an identity. I, for one, hope it’s the identity of a team that sticks up for each other and comes to a teammate’s defense. It could happen, and if it did, the team would be stronger for it. After his entry-level contract expired, Gardiner signed a 5-year, $20,250,000 contract with the Maple Leafs starting in the 2014-15 season. That contract ends after this season. He will get richer when he signs with another team. Given his treatment by the Maple Leaf fans, I won’t blame him when he goes. When he does, Dubas will be in the market for a puck-moving, offensive defenseman. Surprisingly, just like Gardiner. Funny how that works.